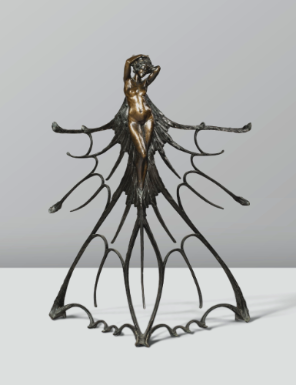 The Sotheby's Art Nouveau sale in Paris yesterday yielded some interesting results. Out of 137 lots, 15 remained unsold. 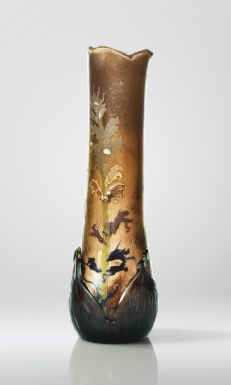 The glass vases by Emile Gallé sold consistently above their estimates (lot 8, a carved and marquetry-verre vase, 1900, pictured above sold at €192,750 with a pre-sale estimate of €80,000-120,000). Gallé's furniture however didn't fare so well with 4 lots remaining unsold. Lot 45, the Majorelle 'Miroir aux Nenuphars' pictured in our pre-sale post, sold at €54,750 (estimate €15,000-20,000) while the star lot, René Lalique's 1900 sculpture in bronze of a woman, lot 98 pictured above, far over-reached its estimate of €200,000-300,000 and went for €1,240,750.